We hope you've enjoyed this tournament so far. This sixteen-book bracket, our sixth, contained books from across the genre. There were science fiction, high fantasy, urban fantasy and horror books. Hopefully some sparked your interest. Good books can and do get knocked out of the competition in the first and second rounds due to strong competitors. I know there are books that I (Amy) would like to read. Stopping reading good books after only 25 or 50 pages can be difficult, and so can judging between two completely different books. The Battle of the Books format allows us to sample and spread the word about many more new books and authors than we otherwise could. Now only four books remain. All four "seeded" books made it to the Final Four. This is the first time this has happened. We have had a great response to the Battle of the Books format. More brackets are to come! Our last second round match of Bracket Six of the Fantastic Reviews Battle of the Books has No Peace for the Damned by Megan Powell doing battle with Be My Enemy by Ian McDonald. 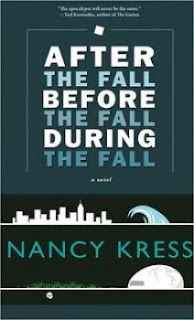 The winner will be the book I (Aaron) most want to continue reading after the first 50 pages. No Peace for the Damned: 47North trade paperback, July 2012, 252 pages, uncredited cover art. 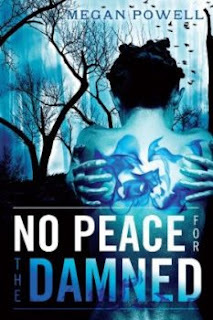 No Peace for the Damned is Megan Powell's debut novel and book one of the Magnolia Kelch urban fantasy series. It reached the second round with a win over The 13th Zookeeper by Bernd Struben. The opening 25 pages of No Peace for the Damned introduced us to Magnolia Kelch, a young woman with remarkable abilities, including mind-reading and regenerating her body, even after horrible injuries. Magnolia has escaped from her evil and ambitious family and volunteered to join the Network, a secret organization aligned against her family. The second 25 pages give us more flashbacks to Magnolia's mistreatment by her family, all of whom despise her, in part because they fear she will become too powerful to control. Meanwhile, Magnolia is having trouble gaining acceptance by the other members of the Network, most of whom mistrust her motives. Be My Enemy: Pyr hardcover, September 2012, 263 pages, cover art by John Picacio. Be My Enemy is the second volume in Ian McDonald's Everness young adult series, after Planesrunner, although it is not difficult to follow without having read the earlier book. Be My Enemy got here with a first-round win over Besieged by Rowena Cory Daniells. Be My Enemy stars two different versions of teenager Everett Singh, from two different alternate universes. 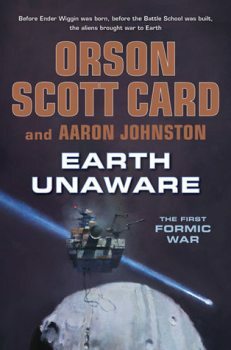 One Everett Singh, a crewmember of the airship Everness, is working furiously to try to get the ship out of a frozen wasteland alternate Earth, as a massive warship closes in on them. The other Everett has been modified by a strange alien race, adapted into the ultimate soldier. Both Everetts are intent on finding the airship-Everett's father. The Battle: One thing I love about the Battle of the Books is it prompts me to sample a whole lot of great stuff that I probably would have missed otherwise. I had never heard of Megan Powell and am not all that intent on finding a new urban fantasy series to read, but so far No Peace for the Damned is most engaging and interesting. 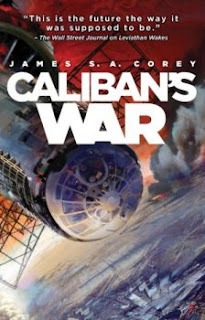 Meanwhile, I am certainly familiar with Ian McDonald, one of the leading SF authors working today, but I probably would have been more inclined to read some of his adult books that I've missed, rather than his new YA series. Yet judging from the first 50 pages of Be My Enemy, this series compares favorably with McDonald's best work, which is saying quite a lot. Through 50 pages, No Peace for the Damned is flowing very smoothly, and Megan Powell has done a marvelous job of generating sympathy for her main character Magnolia Kelch. Magnolia has an impressive array of abilities——mind-reading, telekinesis, becoming invisible——and yet she very much still seems the underdog, because her entire powerful family is aligned against her, while most of the members of the Network are also hostile to her. I am quite interested to see how she settles into the group, and how she combats her delightfully malicious family. There is also a potential romance brewing between Magnolia and one of the other members of the Network, but I'm less interested in that, because Powell has so far given no reason for Magnolia's attraction to the guy other than his looks. Meanwhile, the opening of Be My Enemy is slam-bang awesome. Both Everett characters are engaging, and the similarities and differences between them are most interesting. McDonald also lets us see enough of the other characters around them to pull us into the story. The characters surrounding the Everett out on the ice are a very likeable group, particularly the captain and her spunky young daughter, who get to star in a terrific aerial battle in the second 25-page section. The characters the other Everett are encountering are a dangerous, perhaps trecherous lot, while the aliens' purposes are enigmatic. The latter Everett has so far retained his own personality through the physical changes he has undergone, but it will be a challenge for him to maintain that as he works alongside this ruthless group. It's always a test whether a sequel can pull me into the story quickly enough to do well in the Battle of the Books. 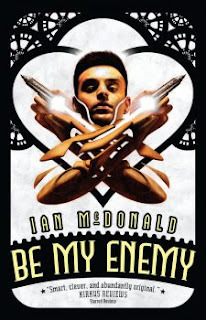 It's a testimony to Ian McDonald's skills that I'm fully enjoying Be My Enemy, while at the same time anxious to go back and read the prequel Planesrunner. No Peace for the Damned is off to a solid start, but Be My Enemy is the book that already has me fully absorbed in the story. Be My Enemy advances to the semifinals, where it will take on Caliban's War by James S.A. Corey, aka Daniel Abraham and Ty Franck.